NASCAR drivers know to stay away from the curbs in Martinsville, but Wednesday was different. MARTINSVILLE (WSLS 10) - NASCAR drivers know to stay away from the curbs in Martinsville, but Wednesday was different. 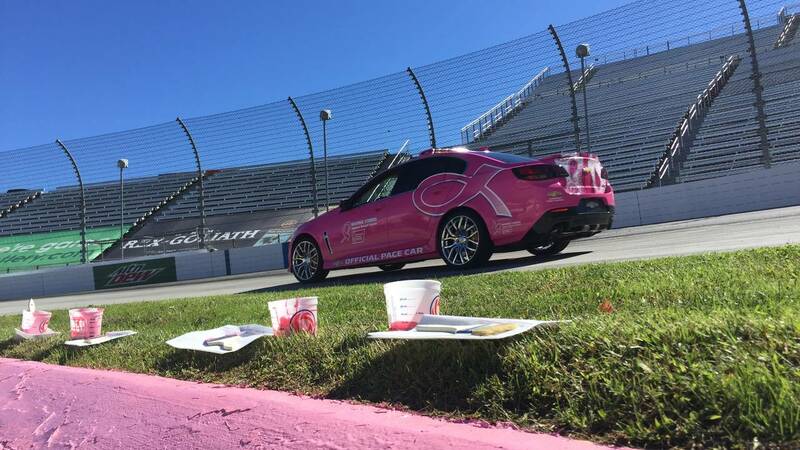 Team Chevy painted the curbs at the Speedway pink Wednesday morning in recognition of breast cancer awareness month. Sprint Cup driver Kyle Larson was also there, showing off the pink Chevy pace car. Larson also took several breast cancer survivors on laps around the track. Workers at the Speedway said it was an honor to recognize those who fight the disease. Clay Campbell with the Speedway explained, "This is probably the most iconic piece of real estate in motor sports, these curbs. November 1, millions of people will see it on TV. Thousands of people will see it here in person. So again, it's just a small role that we can play but we're more than eager to do that." The fall race in Martinsville is November 1.